The centenary of the start of World War I is just a few weeks away and there will no doubt be many new books published to mark this event. Nigel Jones has written an interesting take on the Great War as he describes Britain (and Ireland) in the lead up to and the beginning of the war. I had read a review of this book in the Irish Times, and at just £2.99 for the Kindle version (£25 for print version) it was excellent value. The book is divided several interesting sections (and some uninteresting sections). This includes a chapter devoted to Ireland and the question of Home Rule. I had not realised how close Ireland was to Civil War in 1914 and that the Great War effectively interrupted our own march to internal strife. Other chapters of interest are on Votes for Women, Liners, Clubs, and "The Season". Of less interest to me were the chapters on Poets and Painters. Jones could do with a geography lesson - in the chapter on "Liners" he describes the Britannic (sister ship of the Titanic) being launched "into the waiting waters of Lough Neagh", which of course is an inland lake 25kms away from Belfast Lough where the ship was actually launched. One thing that comes through in this and many other books on World War I is the inevitability that Europe was drifting helplessly towards war with nobody willing to stop it. As Jones points out at the beginning of Chapter 12: "Britain was not ready for war", but she fought anyway with a huge volunteer army that included thousands of Irishmen (including my great-grandfather - James Burns). 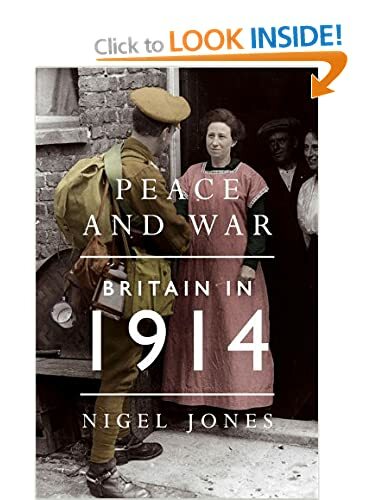 Jones has written a super book with a different angle on this cataclysmic event that will appeal to all readers of popular history. Recommended.